•	Tough Love is 100% free from harmful chemicals. It has no phosphates, dyes, petroleum and chlorine. •	It’s biodegradable and non-toxic. •	It’s 99.99% natural containing coconut-derived ingredients. •	Its lemon-calamansi scent leaves the dishes smelling fresh and clean. •	It doesn’t dry the hands even after multiple washing. •	It doesn’t pose a threat to the environment because it’s biodegradable. •	It’s safe to use because it doesn’t have chemical residues. •	According to the product label, it may appear a bit cloudy at temperatures below 30°C which they say doesn’t affect the quality and effectiveness of the product. This is something I haven’t experienced yet, but in case I do, I don’t think it’s going to be a problem. •	You may need a few more squirts of Tough Love to clean overly greasy dishes, but aren’t all dishwashing liquids like that? I have no idea how much Tough Love Natural Dishwashing Liquid Costs, but I would love to buy another 250 ml bottle of this because it’s gentle on my hands, it’s safe and effective to use and it’s environment-friendly, too. 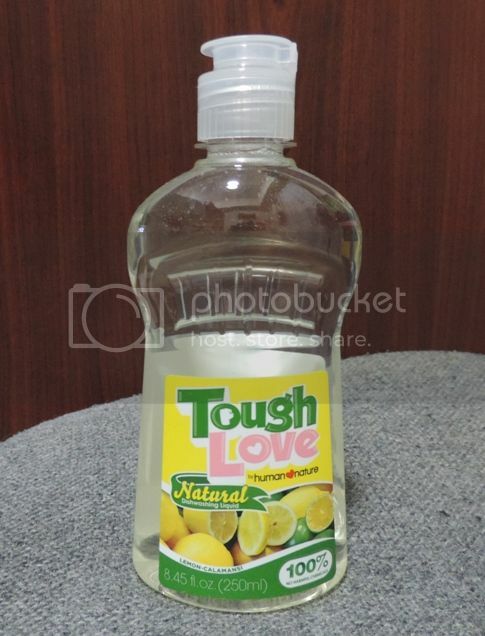 This entry was posted in Human Nature, Product Review, Tough Love Natural Dishwashing Liquid. Bookmark the permalink. I currently use Axion, I wonder if this cuts grease as well as Axion. I hope this is available at Robinsons Supermarket so I can try.